Our Desert Southwest Conference offers a Sidewalk Sunday Ministry. This ministry takes church to the streets so all children can have the opportunity to learn about God. This ministry offers Christmas gift bags to the children that they meet and serve. Our Sunday School classrooms support this ministry by collecting items to fill 25 gift bags in November. Every year North Scottsdale United Methodist Church's Sunday School classrooms support this ministry. This year we will begin collecting the items on Sunday November, 6th and we will continue to collect through Sunday November 20th, 2016. Each class is asked to fill five gift bags for children ages 3-10 years old. 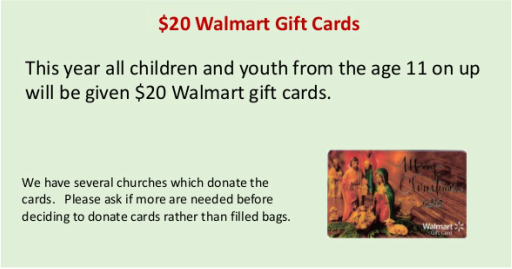 Walmart gift cards are requested for the teenage students. ​The Education Committee and your child’s Sunday School classroom are working together on a mission project to help children who will most likely not receive a Christmas present this year. Each classroom is asked to fill five (5) 10” x 13” Christmas bags. 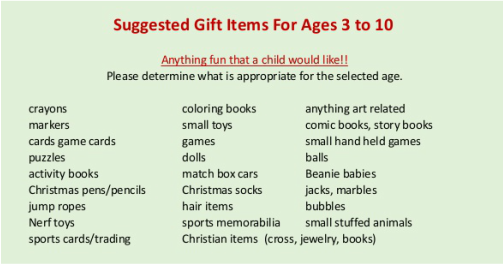 The suggested gift items for 4 to 12 year olds are: crayons & coloring books, anything art related, markers, simple craft kits, small toys, comic books, story books, sports cards, sports memorabilia, balls, small hand held games, games, puzzles, Beanie babies, activity books, match box cars, Nerf toys, Christmas pens/pencils, Christmas socks, jacks, marbles, jump ropes, hair items, Christian items (cross, jewelry, books), gift cards (McDonalds, other fast foods) small stuffed animals. Anything fun that a child would like!! We are asking each Sunday School classroom and congregation members to work together to fill two dozen bags. There will be a box in the fellowship hall as well as in each classroom. The items are due to church on or prior to Sunday, November 22nd. If you have any questions please ask your Sunday School teacher.